The Riviera Maya is one of the most attractive places on the Yucatan Peninsula and in all of Mexico. 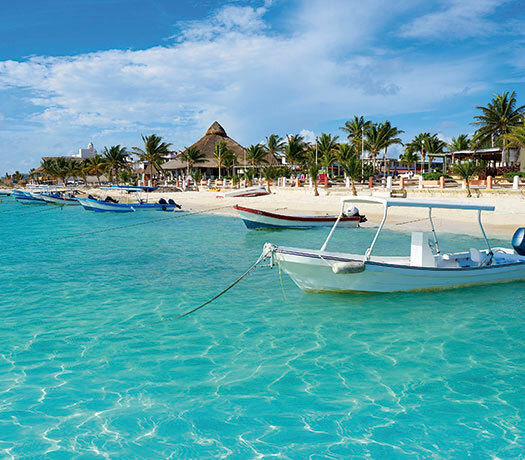 Full of wonderful natural attractions, this 80-mile long stretch of fine white sandy beaches bathed by the cool, crystalline waters of the Caribbean Sea is the second most visited tourist destination in Mexico. The Riviera Maya extends from the small town of Puerto Morelos, 20 miles south of Cancun, to the tiny fishing village of Punta Allen, approximately 40 miles south of the famous Tulum archaeological site. Thanks to a modern highway infrastructure featuring bridges and freeways, travel between these destinations is fast and safe. The region has impressive hospitality facilities, offering more than 50,000 rooms set across hotels varying from small boutiques to impressive resort complexes. The standout attractions here are the wonderful white sandy beaches and the crystalline turquoise waters of the Caribbean Sea, which is home to the second largest coral reef on the planet, The Mayan Reef, with its rich and colorful flora and fauna. 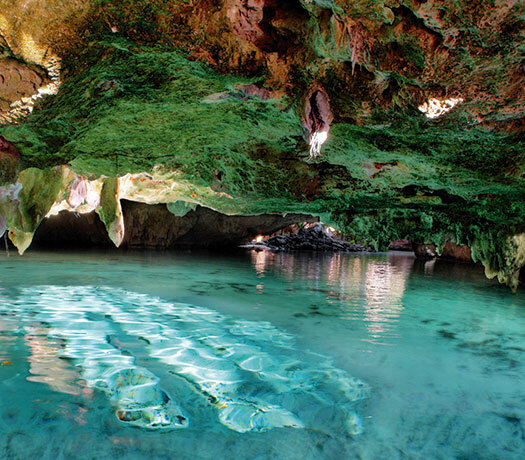 Other wonderful things to see include Ox Bel Ha, Sac Actun, and Dos Ojos, which are the three longest underground rivers on the planet and form part of the amazing Mayan subsoil, where you’ll find beautiful “cenotes” (sinkholes) unique to the region. 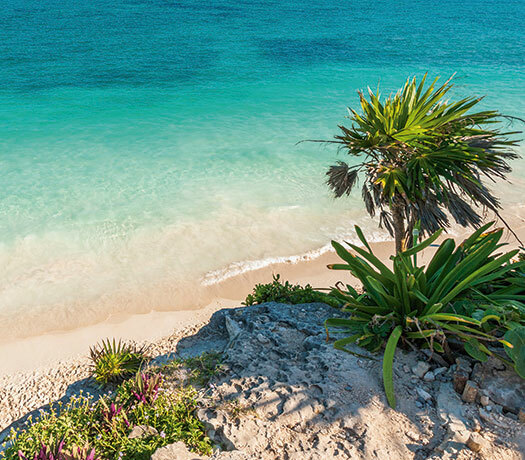 Featuring impressive archaeological sites left behind by the ancient Mayans, such as majestic Tulum and Coba, this is an area privileged with great natural beauty and a fascinating history. There are endless tours and excursions available in the Riviera Maya, which include snorkeling, scuba diving, swimming with dolphins, trips on ATVs, boats, yachts, or catamarans, and visits to fabulous eco parks, to name but a few. Something important to note here is the influence of sustainable tourism, meaning that the excursions take care of the environment in which they take place, bringing more and more visitors to the Riviera Maya every day. 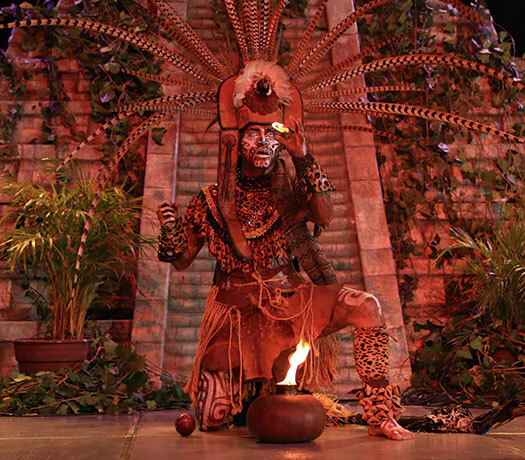 There’s lots of options available in the Riviera Maya for event hosting, with everything from themed cave dinners to cenotes, cavers, eco-parks, restaurants, and archaeological sites. The destinations attractions and wide range of hotels and resorts cater to all budgets. 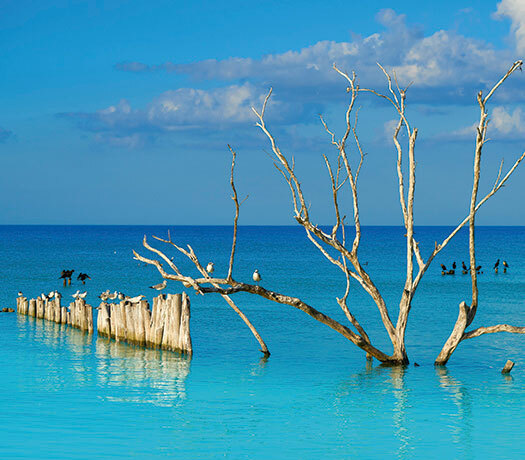 The Yucatan Peninsula is famous for its majestic archaeological sites, a legacy left by the ancient Mayans. 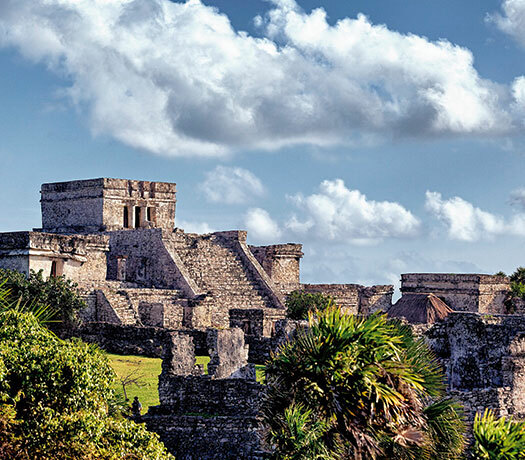 The Riviera Maya forms part of this area, and is privileged to have a small but iconic archaeological site. 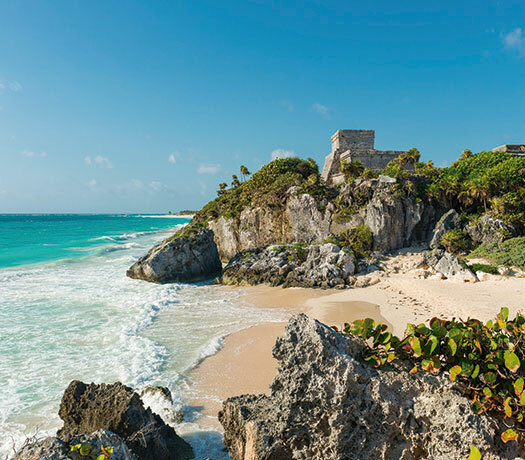 As a port, Tulum is one of a kind, with a breathtaking location on a cliff dominating the Caribbean coastline. From its main structure, El Castillo (The Castle), you can admire the Caribbean Sea with its crystalline turquoise waters in all its glory. This ancient site is, in addition to being the only Mayan archaeological zone on the coast, also the second most visited site on the whole peninsula. Despite technically being located outside the Riviera Maya, Coba is an excellent place to explore and find out more about the Mayans of Quintana Roo. Located just 60 miles from Playa del Carmen, the 90-minute journey feels worth it as you climb up the 45 yards to the top of Nohoch Muul, the tallest pyramid in the Yucatan Peninsula. The Riviera Maya has some of the most well-known, attractive and unique parks in Mexico. Here you will find everything from impressive eco parks to fascinating theme parks located completely underground. Xcaret is the most incredible eco-park in the Riviera Maya and all of Mexico, located just minutes away from Playa del Carmen. It offers unique attractions that include two crystalline underground rivers where you can swim or snorkel, a dolphinarium, and rare flora and fauna. The park also puts on shows throughout the day, as well as an unmissable display of Mexican history and culture at night. Other parks that are well-worth a mention are Xel-Ha, an estuary home to the largest natural aquarium in the world; Aktun Chen, with a 700-yard underground cave network and a crystalline sinkhole; Sian Ka’an Biosphere Reserve, with its exuberating eco-tours; and Rio Secreto, with its underground rivers and caverns filled with stalagmites and stalactites. Just as New York has the 5th Avenue, the Riviera Maya has its own and no less famous and busy Quinta Avenida (Fifth Avenue) in Playa del Carmen, where you’ll find a concentration of modern shopping malls and renowned boutiques. Shopping in the Riviera Maya will satisfy even the most demanding of shopaholics. You will also find small shops with handicrafts made by local people, ranging from colorful pottery, to handmade jewelry, beautiful pieces of silver and other precious metals. One of the main reasons to choose the Riviera Maya to hold your next business meeting, incentive trip or event, is the famous Mexican hospitality and the warm service we provide, something that will help to make your event a rousing success. Thanks to this, we have managed to build a strong base of repeat visitors, who have gone home satisfied and eager to return to our destination, time after time. Riviera Maya features impressive hospitality facilities with more than 50,000 rooms. The standout among them are the magnificent resort complexes, many of which offer the “All Inclusive” plan and are ideal for organizing events, congresses and conventions. 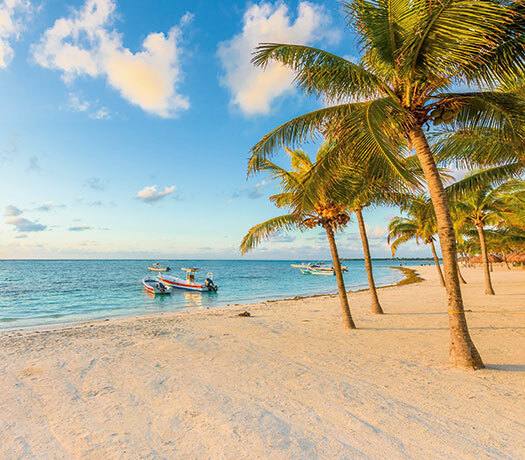 The heart of the Riviera Maya, Playa del Carmen is a world-famous tourist destination with modern, attractive facilities, as well as white sandy beaches bathed by the sublime turquoise waters of the Caribbean Sea. It is a perfect place for nature lovers, water sports and extreme adventures, as it offers cenotes, eco-adventure parks like Xcaret, and diving and snorkeling at the Great Mayan Reef, just a hundred meters from the shore, among other natural wonders. 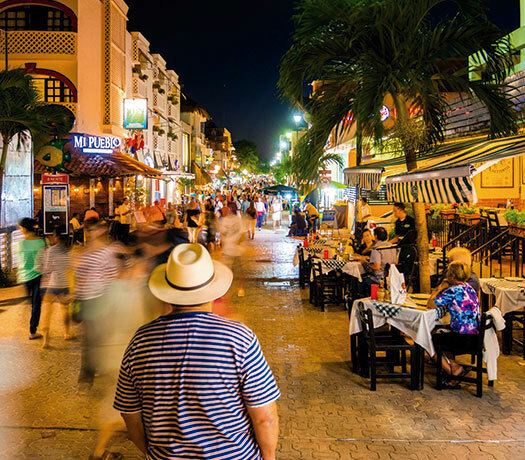 A sophisticated, cosmopolitan and carefree atmosphere is what you can enjoy during your time in Playa del Carmen. Most of the action centers around the Quinta Avenida, a pedestrian street where you’ll find a wide variety of restaurants, ranging from traditional haute cuisine; minimalist bars and clubs that form the hub of the city’s nightlife; modern shopping centers and outdoor craft stores; as well as hotels of all kinds. 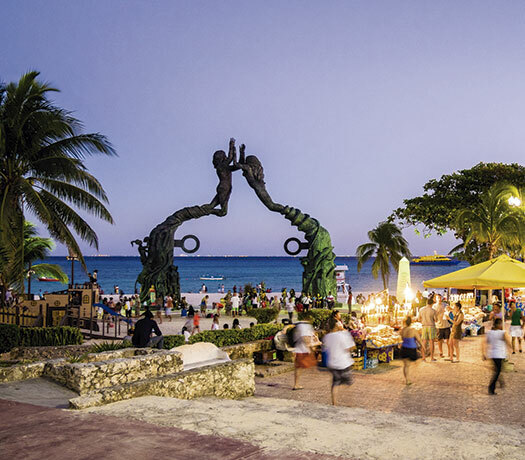 All this comes together to make Playa del Carmen a paradise-like, charming destination that has become a magnet for visitors from all over the world. 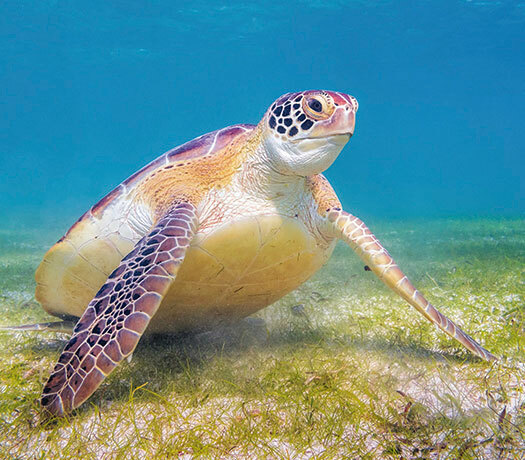 Akumal means ''place of turtles'' in Mayan and it is here where every year, hundreds of green and loggerhead turtles arrive to lay their eggs on the beach during the summer. This was the first destination developed in the Riviera Maya, long before Cancun; even when the only way to access the bay was by the sea. Nevertheless, it has managed to maintain its laid-back, relaxed atmosphere, while also offering excellent restaurants, hotels and services. 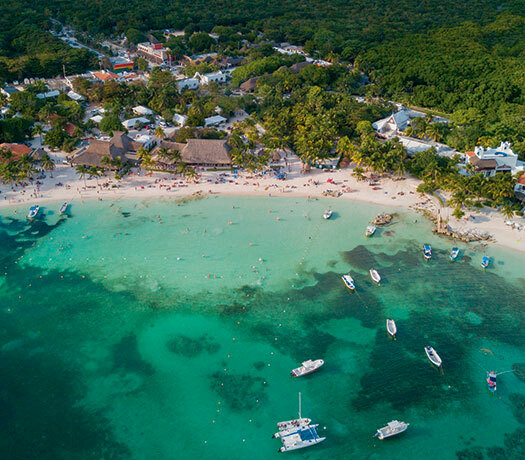 Akumal is located just 20 miles south of Playa del Carmen and is an excellent starting point for people looking to explore the Great Mayan Reef. If you walk just one mile to the north, you will find the gorgeous Yalku Bay. Tulum is home to the largest Mayan coastal construction ever built and the second most visited archeological site in Mexico. Located just 80 miles south of Cancun, the walled city of Tulum was the first Mayan community sighted by the Spanish when they arrived in the 16th century and was a major center of commerce. Tulum is a uniquely impressive site in general but the El Castillo (The Castle) building is by far the most important, perched high atop limestone cliffs that look over the turquoise waters of the Caribbean Sea below. At one time it functioned as a lighthouse, guiding ships through the treacherous reefs that lie offshore. Another interesting structure at Tulum is the Temple of the Frescoes with its wall paintings, on which the original pigment used to paint the carved figures can still be seen. 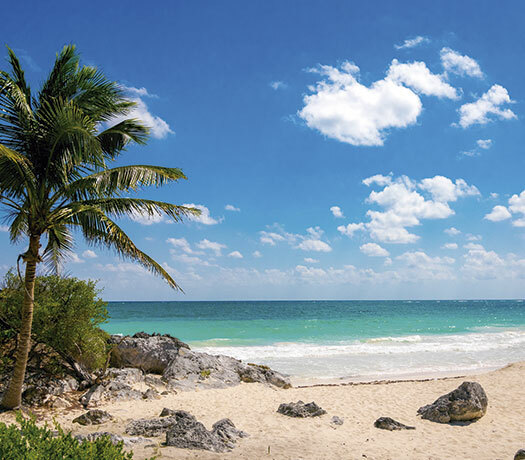 Tulum is a must-see attraction in the Riviera Maya. 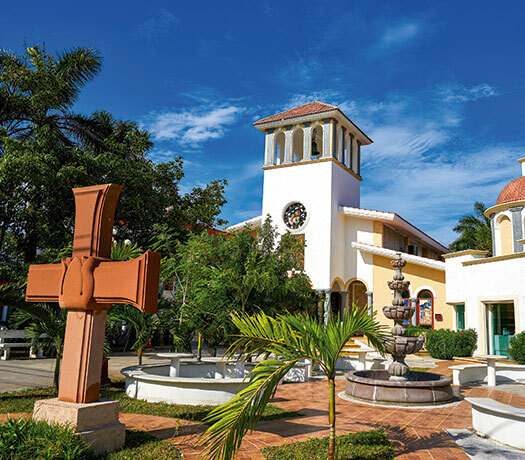 Located about 20 miles south of Cancun, this small village has a low-key, relaxed atmosphere. 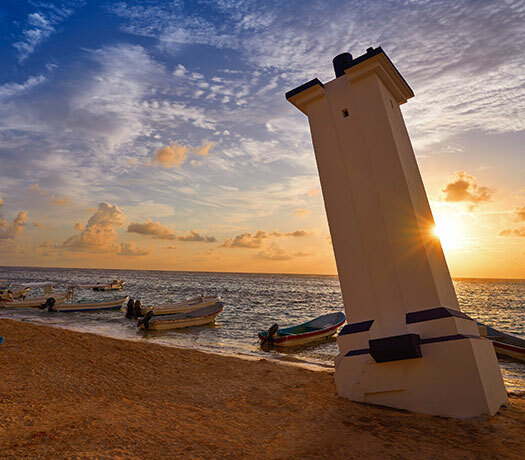 You’ll love walking the streets of Puerto Morelos, admiring charming local restaurants, cafes and shops, as well as the leaning lighthouse, which was affected by several hurricanes and has been that way ever since, making it a classic postcard image of the place. The white sandy beaches of Puerto Morelos are among the most beautiful in the Mexican Caribbean. Thanks to the protection of the reef they are calm and great for swimming, while also being a magnet for people who are into diving and snorkeling. Wave runners are not allowed here due to regulations designed to conserve the marine fauna and the tranquility of residents and visitors. It is here, in Puerto Morelos, where the majestic Riviera Maya begins.